Countless people in this world are troubled to varying degrees by refractive errors that distort their vision, but keratoconus can cause some very troubling problems indeed. This extreme irregularity of the corneas can leave you with severe myopia, astigmatism, and periods of corneal injury where your eyesight suddenly gets dramatically worse. Fortunately, techniques are available to treat keratoconus and help you maintain optimal eyesight. Here at Butler Eyecare in Lebanon, MO, we're happy to provide keratoconus treatment for residents of Lebanon Township, Marshfield, St. Robert, and Camdenton. The transparent semi-sphere known as the cornea isn't just a window into the eye, it's a vital contributor to the way light is refracted by the eye. The consistent curvature helps to ensure that the incoming light passes through the lens in the correct way, allowing the lens to send focused images to the retina. In the case of keratoconus, your corneas are more cone-shaped than spherical. The irregular bulging of the corneas usually begins in adolescence or young adulthood, although it can start earlier or later. While no one is sure why keratoconus strikes some people and not others, possible factors may include genetics, weak or thin corneal tissues, oxidative damage to the corneas, and excessive rubbing of the eyes. Whatever may be behind your keratoconus development, the results are plain enough. The distortion of incoming light by the bulging corneas causes significant myopia (nearsightedness) and astigmatism, leaving you with blurry vision. The more pronounced the bulge becomes, the more strain the corneal tissue experiences. If the tissue splits or cracks, you may experience tissue swelling that compounds your vision problems for weeks at a time. Our Lebanon optometrist, Dr. Cylinda Butler, has extensive experience in diagnosing and treating refractive errors and eye disorders, including keratoconus. A comprehensive eye exam can reveal whether your corneas show the classic bulge of keratoconus. Vision testing helps us understand just how the disorder is currently affecting your eyesight. 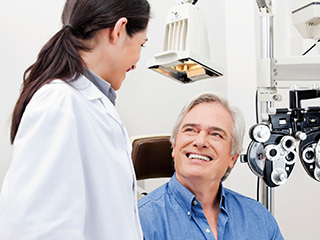 Treatment recommendations at our optometry center will depend on the severity of your condition. For mild keratoconus, eyeglasses or standard soft contacts may be sufficient. For more advanced cases, however, GP (gas permeable) lenses will do a better job. Scleral lenses are often the most effective option because they vault completely over the corneas, providing their own consistent curve. Need Keratoconus Care in Lebanon Township, Camdenton, Marshfield or St. Robert? If you're looking for keratoconus care in Lebanon Township, Camdenton, Marshfield or St. Robert, Butler Eyecare is the optometry center for you. Call 417-991-3200!